Relax your body and mind with a Swedish massage. New moms-to-be can enjoy our pre-natal massage, or loosen up those tense muscles with a deep tissue massage. Each of our locations offers a full line of professional hair care, wigs, fashion accessories and nail polish in addition to our full-service salons. 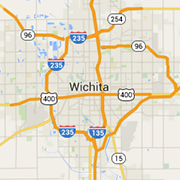 Providing east and west Wichita with the products and knowledge necessary to achieve and exceed their fitness goals. Providing patients with state of the art aesthetics treatments in a safe medical environment. Let us help you forget the stresses of the day and just relax and be pampered. Specializing in cut, color, extension and smoothing treatments. Kansas Surgical Arts specializes in cosmetic surgery, vein care and a wide range of results-oriented clinical skin care and aesthetic procedures. Providing Wichita with an all natural sunless tanning experience. Providing Wichita and Andover with the products, knowledge, and support to help you reach your fitness goals.